It can scarcely have escaped anyone’s attention that 2013 is the 200th anniversary of Dickens’ birth – anyone who has not been in a medically induced coma for the past months, that is. If you missed the last two biographies (one, by Michael Slater, jumping the gun in 2009, another, by Claire Tomalin, published a couple of months ago), then there is another coming along in a couple of weeks, by the actor Simon Callow, who has also been performing his seasonal ‘one-man theatrical extravaganza’ adaptation of A Christmas Carol. Or you could watch the current BBC’s production of The Mystery of Edwin Drood. That is, if you’ve finished watching their version of Great Expectations. Or listening to the radio retelling of A Tale of Two Cities, or learning about his favourite songs on Charles Dickens’ iPod (yes, really), or exploring an Indian reimagining, The Mumbai Chuzzlewits. Or watching Armando Iannucci telling us why he was funny, or Sue Perkins on his poor, much-maligned wife, on Mrs Dickens’ Family Christmas. If you’re more academically inclined, you can present a video about Dickens at a free online conference. That is, if you don’t want to wait, and pay for a cinema ticket to the soon-to-be released Great Expectations with Helena Bonham-Carter, paying for it with the new £2-coin featuring – who else? Or, who knows, let’s be crazy, you could even read one of the books. And Dickens is international. Be it As Aventuras de Oliver Twist from Brazil, or Twist Olivér in Hungary, or Italy’s Storia di un orfano, everyone knows Oliver and Fagin, not to mention David Copperfield, Mr Micawber, Edwin Drood, Mr Pickwick and the rest of the familiar troop. Or they know about them. Or their names. Or the plots, sort of. Can you name the characters in Thackeray’s Vanity Fair? A few may dredge up Becky Sharp. Never mind the characters, can you name another Thackeray novel? Thought not. So part of the argument for the Dickens-fest we are enjoying-enduring is circular: we like Dickens because he is popular, he is popular because we like him. But there is another, deeper, and more important, reason that Dickens is popular, one that resonates particularly in our own time, and that is the story of his own life. Dickens, as everybody knows, was a lower-middle-class boy made good after a dreadful childhood, when his father was imprisoned for debt and he was sent to work in a blacking-factory. True, no one really has much idea of what a blacking-factory is these days, but we’re unanimous in knowing it is pretty bad. And bad it was. Dickens was taken out of school when he was twelve, and he worked pasting labels on blacking (which is shoe-polish, by the way) pots, possibly for as much as a year, before his father, finances temporarily recovered, returned him to school. But he left school for good only two years later, aged fifteen, and went to work as a lawyer’s junior clerk. 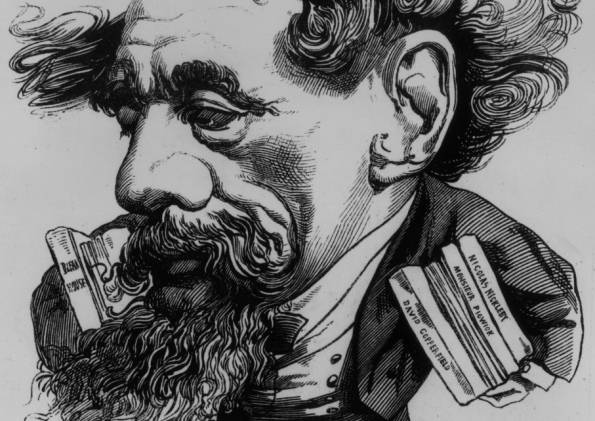 In these divided times – the super-rich and the jobless, with little certainty in between, the frothing religious fundamentalists and the screamingly secular, the climate-change believers and deniers – everything seems as sharply divided as Dickens saw it. And unlike Thackeray, unlike Jane Austen, Dickens didn’t write about the graciously upper class, the respectably wealthy. Some of his characters were – there is Sir Leicester Dedlock, Bart, carefully given his title every time. But most of his characters were not. Some were indigent: I know of no character in literature more moving than Jo the crossing-sweeper in Bleak House, who has grown up on the streets, and ‘Don’t know that everybody has two names. Never heerd of sich a think.’ He has no family, no friends, has never been to school, and isn’t sure what the word ‘home’ means. Even more of Dickens’ characters are what became known as ‘shabby-genteel’: people who are keeping up appearances, despite precarious finances, despite irrevocably sliding down the social scale, possibly losing a job, losing a family, losing everything, as the Dickens family once had so traumatically. In our own times, this speaks to us as we desperately work harder and harder, run faster and faster merely to stay in the same place. Primark, Walmart and Lidl may mean that we no longer look ‘shabby’; a more informal dress-code means no one really looks ‘genteel’, either, but in these decades of stagnating middle-class wages, in times when university education seems to be moving beyond the reach of many who had previously expected it, when social mobility seems to work in only one direction, the idea of lives lived precariously poised on the edge of financial despair is one we all recognize. For, finally, it is the fear of destitution, and hope and idealization of the future, so uniquely mingled in this writer, whose books are more bizarre than any adaptation can do justice to, that makes him meaningful for our day as much as his day. Too many adaptations make his novels seem no different from Sherlock Holmes, all quaint hansom cabs, cobblestone streets and weirdly stilted prose used to indicate a generalized ‘past times’. What makes him powerful, though, is the present. In the BBC’s recent Great Expectations, there was much to disapprove of. (And I did, God knows.) But when the convict Magwitch, on the run, erupts from the marshes, grabbing the child Pip’s foot as he crosses a bridge, it encapsulates every child’s universal terror. It is just so that all children imagine a monster will emerge from under their beds, bursting into their nice safe world and bringing it crashing down. For Dickens is not safe, he is not ‘heritage’. He is fierce, and ferocious, and formidable. For much of the past century, it was fashionable to dismiss Dickens as ‘sentimental’. But in hard times, Dickens is once again ‘our’ writer precisely because he never forgets the houseless: never forgets the fear and shame of being houseless, before showing the security and haven in returning to family, to home, to being loved once more. This entry was posted in Journalism and tagged 19th century, Books, Dickens, Wall Street Journal by inspectorbucket. Bookmark the permalink.